Let’s face it, preparing daily meals can become an arduous task. Tried and true recipes can dull over time with too much use and coming up with something new can feel overwhelming. But with the new, free A SNAP Cookbook Good and Cheap,mealtime will be an, er, snap! Food Studies at New York University. After she posted a free PDF on her website, it went viral on Reddit, Tumblr, and elsewhere—almost 100,000 downloads in the first few weeks! 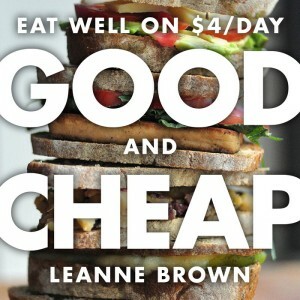 On the heels of her success, she decided to launch a Kickstarter campaign to get printed copies of Good and Cheap into the hands of people without computers or who wouldn’t otherwise see it. The recipes are designed for the budget of people on SNAP (the US program that used to be called Food Stamps). The meals are generally healthy and feature pantry basics used in a vairety of ways to maximize taste and minimize boredom. More than in most cookbooks, the recipes are flexible and encourage substitution based on availability, taste, and price. To encourage people to eat fruits and vegetables, the recipes do not feature large amounts of meat. Many recipe collections created for Americans use meat as the central feature of most meals. While the cookbook was originally written for those using SNAP, the recipes will resonate with anyone interested in creating delicious, easy, healthy food, on a budget or not. The recipes will nourish your body and delight your family. This e-cookbook is meant to be shared, at no cost, so send it to friends and family. Click here to download your copy now.